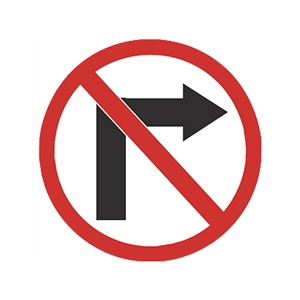 This sign indicates that turns in the direction of the arrow (in this case, to the right) are prohibited. When following a station wagon. When following a driver who cannot see the rear of their vehicle. When following a small passenger car. Drivers of trucks, buses, vans, or any vehicles pulling campers or trailers may not be able to see you if you are driving directly behind them. Increase your following distance when driving behind one of these vehicles. Additionally, large vehicles can block your view of the road, so increase your following distance to look around the sides of the vehicle and see the road ahead. Just the windshield and passenger window. It is important that you are able to see clearly through all of your vehicle's windows, including the windshield. Remove all snow, ice, and frost from your vehicle's windows and mirrors before you start to drive. What should you do with loose objects in your motor vehicle? Place them on the floor near the driver's seat. Secure them to avoid additional driving hazards. Place them on the dashboard. Make sure there are no loose objects in your vehicle that could hit and injure someone in the event of a sudden stop or crash. Make sure there are no objects on the floor that could roll under the brake pedal and prevent you from stopping the vehicle. Shift to a lower gear after starting down a steep hill. 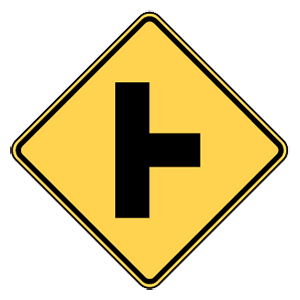 Speed up to enter curves and slow down to exit them. Slow down before entering curves and intersections. Slow down before you enter a curve because you do not know what may be ahead. 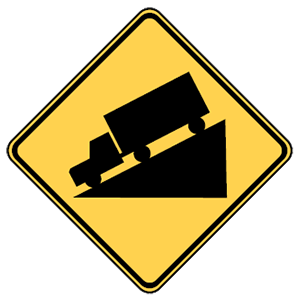 Braking on a curve may cause you to skid.